– act opposite to emotion: Be active, say yes to all opportunities, be social, fake happiness. – put things into perspective: Escape the drama that your mind throws your way and watch the problem as if it was on TV. That way, things will become clearer and more answers will present themselves. – avoid victimization: Something bad is bound to happen but try to avoid making it worse than it already is for any reason, especially to gain attention. The sympathy of others can be helpful but overemphasizing the problem will reinforce the occurrence and depth of negative feelings. – do not avoid the problem: Don’t drink to forget, don’t watch TV or play games to escape, don’t do other things that are less pressing. Deal with the problem as soon as it appears – you will feel better as soon as you start doing something about it. Suffering is not always self-induced, but the intensity of suffering can be controlled. It is often the individual who makes it worse for himself. It is important to be healthy in body, mind and ‘spirit’. ‘Spirit’ does not mean anything other than that which is left out by the body and mind. ‘Spirit’ means the ungraspable, the indescribable. We will touch on that in a later post. 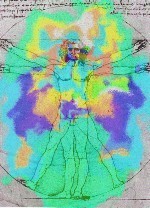 Body and mind interact on very certain terms and influence each other in both positive and negative ways. It is imperative to have a healthy body. To do so one should have a fairly reasonable diet (don’t eat too much sugar or salt, don’t overeat, eat your greens and fruit, drink water instead of coke or pepsi). There should be some exercise on a frequent basis – morning jogging, football, anything… Exercise has a direct influence on serotonin and the chemical reaction that ensues creates happiness and has an overall calming effect. Exercise will make you happy – that is a proven fact. The mind is harder to keep healthy. Alcohol, drugs, cigarettes, caffeine and sugar all have a negative effect on the mind if taken continuously. A slice of cake once in a while or a pint of beer are okay – there will probably be no detrimental long-term effects. Over-indulgence on the other hand can lead to serious negative long-term effects including depression, behavioral change, mood-swings and paranoia. Don’t believe us? Lead a healthy life for two weeks and see for yourself. Be aware that your body needs two weeks to get used to the new regime and release all the toxins – the positive effects will come to the foreground fully only after 2 whole weeks. The first week of conscious avoidance of something to which you have become addicted will show you just how hooked you actually were. Don’t succumb to it, just be horrified to see how much you crave for that substance that you have cut out from your diet. I read a study somewhere stating that 70 % or so of human adult population is hooked on caffeine; the numbers for sugar addiction in the developed world are going to be even higher. What else? Enjoy yourself and don’t let your fears stop you. You know what you want to do with your life on one level or another. Do the hobby that you want to do, learn that language, improve your inter-personal skills, get that job, kiss that girl, become active. Don’t let anyone or anything stop you – including yourself. The more often you face your fears and do things that are uncomfortable the easier it becomes. If you want to change yourself, change your behavior and the rest will follow. I enjoyed the article. The suggestions to avoid victimization is very true and our modern society is all too quick to blame others and play the victim. We also indulge substances that aren’t illegal but we use them like they were! It’s ironic that death of ‘intelligent’ human beings comes at the hands of something simple as sugar, alcohol, tobacco etc. Sometimes I think the reason Atkins diet is so successful is not just it’s truth, but also how good a person feels by having simply stopped taking bad things into their body for two weeks.